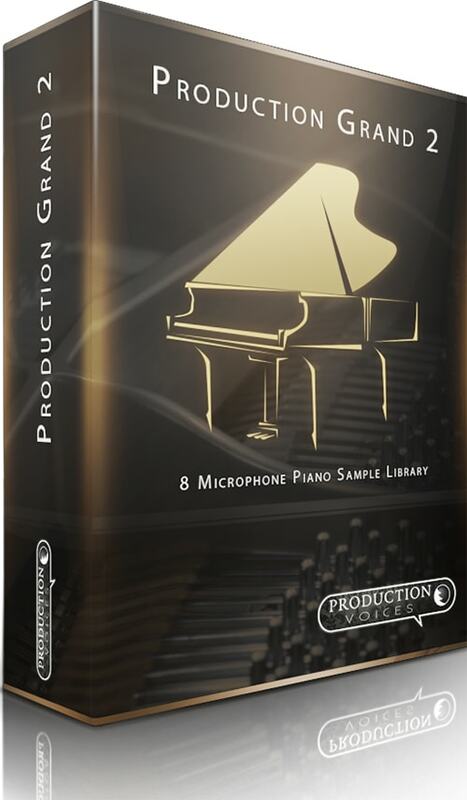 Production Grand 2 is an exceptionally high-quality piano sample library for NI Kontakt 5.6 and above, consisting of eight microphone perspectives and over 120,000 samples of a Yamaha C7 grand piano recorded in a world-class recording studio. The library is 437.5 GB in size*! 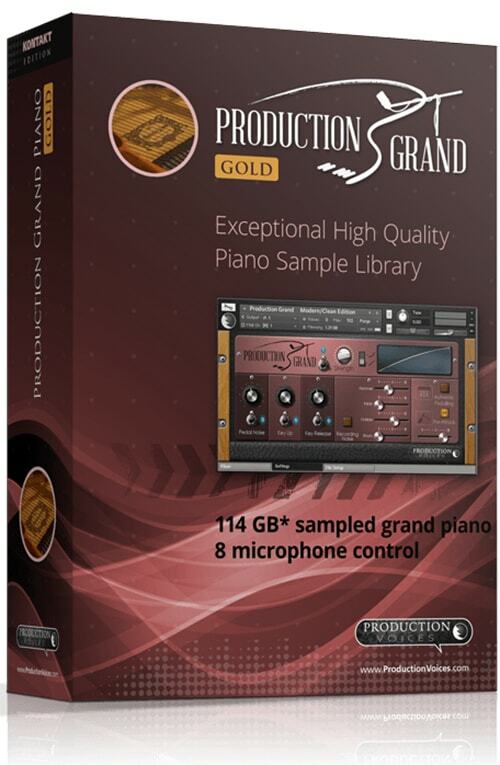 Production Grand Gold Edition is a high-quality premium piano sample library for NI Kontakt 4.2, Kontakt 5 and above, consisting of eight microphone perspectives and over 42,800 samples of a Yamaha C7 grand piano recorded in a world-class recording studio. Production Grand Gold is the downloadable “Gold Edition” from the larger Production Grand. Production Grand Gold contains both the Modern and Vintage 24 bit 44.1 kHz editions of Production Grand. It is complete with eight microphone perspectives. Production Grand Gold requires a full version of Kontakt 4.2 or Kontakt 5 and greater (not provided). •Authentic Pedalling: adds sympathetic resonance and realistic pedal control. •Recorded with world-Class microphones: Coles, AKG, Classic U87s, B&K, Crown etc. •Player’s Perspective: Crown SASS-P MKII for near binaural experience when played! 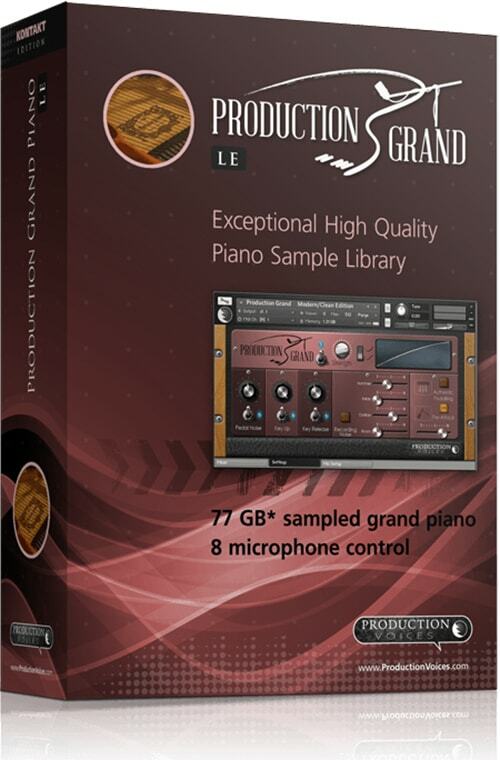 Production Grand LE is a high-quality piano sample library for NI Kontakt 4.2 and above, consisting of eight microphone perspectives and over 42,800 samples of a Yamaha C7 grand piano recorded in a world-class recording studio. Production Grand LE is the downloadable “Light Edition” of the larger Production Grand. 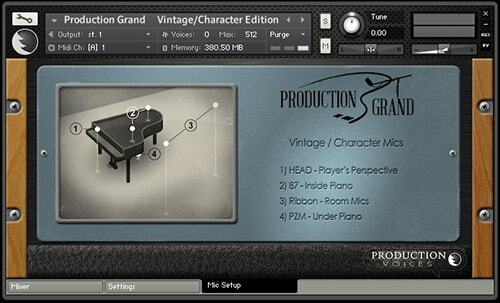 Production Grand LE contains both the Modern and Vintage Silver 16 bit 44.1 kHz editions of Production Grand. It is complete with eight microphone perspectives. Production Grand LE requires a full version of Kontakt 4.2 or Kontakt 5 and greater (not provided).